Carbon dioxide sequestration: how much and when? Carbon dioxide (CO2) sequestration has been proposed as a key component in technological portfolios for managing anthropogenic climate change, since it may provide a faster and cheaper route to significant reductions in atmospheric CO2 concentrations than abating CO2 production. However, CO2 sequestration is not a perfect substitute for CO2 abatement because CO2 may leak back into the atmosphere (thus imposing future climate change impacts) and because CO2 sequestration requires energy (thus producing more CO2 and depleting fossil fuel resources earlier). Here we use analytical and numerical models to assess the economic efficiency of CO2 sequestration and analyze the optimal timing and extent of CO2 sequestration. The economic efficiency factor of CO2 sequestration can be expressed as the ratio of the marginal net benefits of sequestering CO2 and avoiding CO2 emissions. We derive an analytical solution for this efficiency factor for a simplified case in which we account for CO2 leakage, discounting, the additional fossil fuel requirement of CO2 sequestration, and the growth rate of carbon taxes. In this analytical model, the economic efficiency of CO2 sequestration decreases as the CO2 tax growth rate, leakage rates and energy requirements for CO2 sequestration increase. Increasing discount rates increases the economic efficiency factor. In this simple model, short-term sequestration methods, such as afforestation, can even have negative economic efficiencies. We use a more realistic integrated-assessment model to additionally account for potentially important effects such as learning-by-doing and socio-economic inertia on optimal strategies. We measure the economic efficiency of CO2 sequestration by the ratio of the marginal costs of CO2 sequestration and CO2 abatement along optimal trajectories. We show that the positive impacts of investments in CO2 sequestration through the reduction of future marginal CO2 sequestration costs and the alleviation of future inertia constraints can initially exceed the marginal sequestration costs. As a result, the economic efficiencies of CO2 sequestration can exceed 100% and an optimal strategy will subsidize CO2 sequestration that is initially more expensive than CO2 abatement. The potential economic value of a feasible and acceptable CO2 sequestration technology is equivalent – in the adopted utilitarian model – to a one-time investment of several percent of present gross world product. 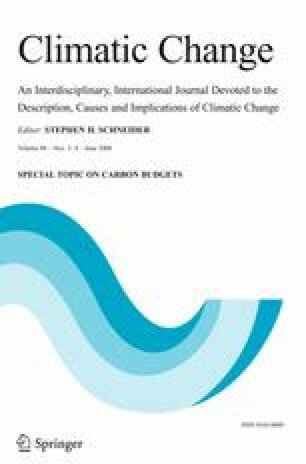 It is optimal in the chosen economic framework to sequester substantial CO2 quantities into reservoirs with small or zero leakage, given published estimates of marginal costs and climate change impacts. The optimal CO2 trajectories in the case of sequestration from air can approach the pre-industrial level, constituting geoengineering. Our analysis is silent on important questions (e.g., the effects of model and parametric uncertainty, the potential learning about these uncertainties, or ethical dimension of such geoengineering strategies), which need to be addressed before our findings can be translated into policy-relevant recommendations.